What would appear to be the title of a Cocteau Twins song or some whimsical Joycean portmanteau for the Beatles’ Let It Be/Abbey Road era is, in actuality, the moniker of a young woman who, by a commodious vicus of recirculation, comes to Portland from Norwich, UK? a Eugene-sized town located inland from the eastern coast in central England. The antithesis of Polly Jean Harvey, the peripatetic Ms. Abbeygate has circled the globe collecting experiences from which she has distilled her unique musical perspective. Inexplicably choosing Las Vegas as a launching site from which to seek fame and fortune, last year Abbeygate garnered “Artist Of The Year” laurels from City Life, a Vegas scene ‘zine. With that feather in her cap, and after a brief stint in Boulder City, Colorado, Karling has migrated to our fair city to unleash her fiery, dark manifesto on an unsuspecting public. Typically, Abbeygate’s songs are torridly sordid vignettes apparently culled from her rather short, yet highly eventful life. Kate Bush and Bjork are obvious musical/spiritual influences, but one hears the petulant defiance of No Doubt’s Gwen Stefani, the over-the-top dramatization of Fiona Apple, the poor breathing techniques of Tori Amos and the vengeful wrath of Alanis Morrisette creeping into her performances as well. “Stargazer” embodies many of those characteristics. As Karling emotes, álà Kate Bush, with a curling lip she tells her tale: “So you’ve had some success on the desperate zone/denee is that tattoo still tender/and it’s all for free at the triple x movie.” A strong chorus and sensitive ensemble work by the backing musicians, drummer Brian Biddulph, bassist Tim Johnson, guitarist James Quill Smith and keyboardist Mitchell Papas, makes of this song a winner right out of the gate. 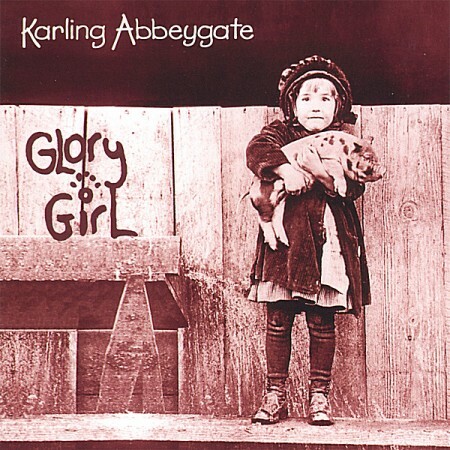 The title track, “Glory Girl” lacks the melodic interest of “Stargazer,” but holds the listener’s interest with a whirring salvo of whining guitars, over which Abbeygate details another Bukowskian tale of the seamy underbelly of life. “In Salome” is melodically light as well. Karling again demonstrates her penchant for either speaking, or singing with a single note, an entire verse, while attempting to make the lyric matter. The lyrics do matter here, very much; but without interesting melodies to add wordless support to the poetry, Abbeygate is forced to rely on vocal histrionics to make a song compelling. This can wear thin over the long haul. Hardscrabble poetry of this nature deserves evocative melodies that oblige the listener to delve deeper rather than to retreat. And in the end, her backing musicians would have more to work with as well. “Man Rat Skin” improves upon the formula somewhat, as Abbeygate relates a harrowing assessment of some unfortunate being: “I don’t know if you’re afraid or a fraud/but you’re not the winner you said you were/you’ve been stealing gifts from my table for too long/and it seems you wrap your jeans around anything/cos’ you’re that true and honest imitation they call/man rat skin.” It would seem Karling’s expectations are too high or that she makes bad choices when selecting her friends. A sense of betrayal seems to color every song. Though the arrangement has more of a jungle feel, the melody of “Lost In The Sun” is very similar to “Goin’ Nowhere.” Still, Karling makes another strong attempt at actually creating a mood and a sense of dynamics, closing in on a memorable melody in the process. And the sweetly pretty lullaby “Time To Go” offers a rare view to her kinder, gentler side, while demonstrating real skill as a songwriter and interpreter. The bluesy timbre of “Mumbo Jumbo Man” easily yields the best results for Abbeygate, wherein she drops many of her mannerisms and simply belts out the song with a fervor that is undeniably singular and powerful. It is with this song, more so than with any of the others, in which she shines brightest; putting together all of her genuine talents into a stellar effort. Karling Abbeygate shows abundant promise with Glory Girl. Her abilities as a singer and songwriter are irrefutable. If she can learn to harness her energy, while reining in her propensity for melodramatic posturing, finding her own true voice along the way, she exhibits every sign of one day becoming a big star. She has all the basic tools necessary. Finn’s unleashes their first full-length CD, a probing, furiously visceral inspection of the human psyche’s darker regions. Seamless Metal sludge is forged hard as steel upon the anvil of flawless ensemble work from the powerful trio that backs vocalist Sean Holman. Bassist Jeannine Dawson and drummer Lloyd Caldwell form a solid foundation over which guitarist Kyle Nees fashions majestic spires constructed of an endless array of riffs and runs. The band kicks off the set with a fiery version of “Heaven (On Their Mind)” from Jesus Christ Superstar, with Holman cast in the role of Teddy Neely. 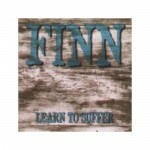 Finn lends a muscular intensity typically lacking in stage performances of the song. Holman’s gruffly supple vocals create a mood of ecstatic terror and desolate foreboding. “Dearly” is propelled by the stuttering swagger of Nees’ relentless guitar and Dawson’s punchy tandem basslines. Dawson and Caldwell create the propulsion on “Walls,” as Nees scrapes jagged chords and sharp riffs against the skeleton of the song, while Holman tears at the flesh with teeth bared. Dawson’s two-note bass figure drives “Say You Love Me” as the guitar and drums join in; plummeting into a frenetic doubletime. Nees escalates into overdrive with series of searing guitar interjections. Holman pushes the envelope on “Bleed,” as Nees lurches through a minefield of dirty guitars, Dawson and Caldwell matching his every move. “Start Again” gathers momentum from a solitary acoustic guitar, launching into a blustery strut. “You Can’t Win” maneuvers through a maze of hairpin turns and dangerous curves. Finn do not stray far from the path here. Every song sticks close to the stylistic locus. But the band executes with deadly precision and rarely makes a wrong move. They know their limitations and do not exceed them, but instead rely upon their greatest strength: impeccable ensemble work. This fact alone separates them from the local pack. More aptly named bands are hard to find in these parts. The Countrypolitans’ sound covers a wide range of standard Country themes and formats with a city slick sense of production. Vocalist Elisabeth Ames calls to mind Carl perkins as much as Patsy Cline with an easy, self-assured delivery and a natural vocal style. The band has added several members since the recording of this five-song demo, further widening the scope of their cosmopolitan Country musings. A full length CD is planned for early Summer release. Another interesting note is the return to Portland of Jeff Hudis, longtime drummer with The Razorbacks in the ’80s, before moving to Seattle to work with Duffy Bishop in the 90s. Hudis’ solidly steady drum work forms the foundation for what, with the addition of pedal steel guitar and occasional brass interjections, has become a very adept Western Swing ensemble. 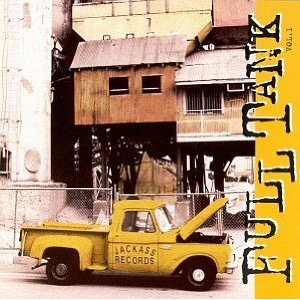 The Countrypolitans have added to the Rockabilly sensibility found on this recording. The Mexacali flavor of “Behind The Night” hints at some of the variety the band now displays. All of the songs here are imbued with a familiar quality: the lilt of Ames’ voice, recorded with an authentic slap-back echo; melodic similarities to well-known Country chestnuts. All of them feature sterling musicianship, from the chunky, rhythmic jangle of the acoustic guitar to the honky tonk bristle of the electric guitar. “Let’s Elope” bears much in common, musically, with Perkins’ “Honey Don’t,” containing large doses of all the aforementioned elements. “A Girl Don’t Have To Drink” maintains a similar stylistic stance, while perhaps depicting the other side of the coin lyrically. “Don’t bother bringin’ a bottle when you call/Coz I like my kisses straight, or not at all/I wanna be sure I remember every one/A girl don’t have to drink to have fun,” Eee- hawww! “Cracker jack” sounds like the Stray Cats doing Gene Vincent. The Countrypolitans show great promise with this outing. Recent live performances give rise to the notion that the band has much to offer, both from the standpoint of historic musical suthenticity (comparable to that of Squirrel Nut Zippers, though from a different era in music), and as a vehicle for high caliber entertainment. Certainly, a band upon which to keep an eye. 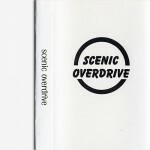 A four-piece unit with something of a pedigree, Scenic Overdrive combines the songwriting talents of peripatetic Pete Ficht, who plays guitar with Joy Pop Turbo as well as with his own band Noisecandy; with that of Corrina Repp who has garnered local acclaim over the past couple of years as a solo performer. They are joined by the former rhythm section of the now-departed Rexaco: Martin Thiel on drums and David Yeager on bass. Ficht’s “Once In A While” is a bright, jaunty little number built upon a three-chord progression, colored in the choruses by Repp’s light harmonies. Corrina’s beautiful voice, a hauntingly dusky contralto, is given the fore on her pretty song, “Significant Other.” Like Joy Pop Turbo, whose most wistful songs tend toward a 6/8 time signature, Repp sets her tender melody upon a tumbling waltz. Contributing a thoughtful lyric that sets into play the conflicts that typically invade any primary relationship, she weighs the consequenses of a life of indepedence versus the need for a sense of family. A piquant gem of a song. Repp’s “I’ve Had My Coffee” explores similar interpersonal themes, while showcasing one of Portland’s most exciting new vocalists. Corrina’s voice has an intelligently sensual character? sort of like Natalie Merchant, without the annoying vocal tics, merged with Karen Carpenter’s wistfully plaintive diffidence. An arresting mixture, to be sure. Ficht counters with “Don’t Fall,” which sounds like Mitch Easter singing XTC’s “Ten Feet Tall.” The chorus falls somewhat short of the possibilities the verses present and the adventurous bridge tends to wander a bit; but it’s a well-crafted Pop song all the same. 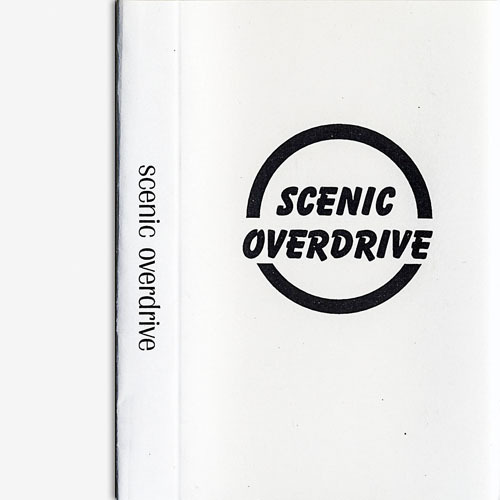 Scenic Overdrive aren’t likely to blow yer head off with their over-the-top antics, but their surehanded songwriting is a decided strength. And Corinna Repp’s winsome vocal presence is another definite plus. It will be interesting to see where the band goes from here. They have yet to assimilate the two songwriters into a single, uniform band sound. Repp and Ficht sound more like each others’ backup band. If they can find a way to meld their separate styles into a comprehensive whole, many great and wonderous things may be possible. 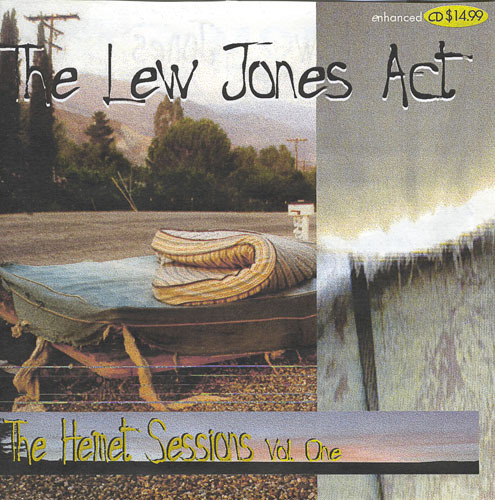 The Lew Jones Act. Now that’s a good one. As if anything the guy ever did wasn’t entirely and sincerely from the heart. It was an act, like Rodney Dangerfield or Jerry Seinfeld. Or that Kramer guy… You see, in reality Lew is an accountant for H&R Block. And this is the busy season don’t ya know. That mystical Folk Bard thing he’s been doing on the side since he was nineteen? Hey, it’s just an act. The thousands and thousands of gigs the man has played along the way? Well, it’s something for him to do with his free time. Counting beans can wear a man down faster than a pair ill-fitting inflatable clown shoes. You can bet on that. 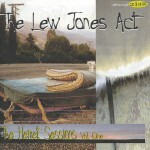 So perhaps The Artist Formerly Known As Lew Jones should henceforth simply be referred to as: The Act. He could adopt the happy mask/sad mask Theatre insignia as his logo. The Act. Of course the difficulty is that, even after all that, the guy would still be Lew Jones. And that wouldn’t be a bad thing at all. For in reality, every city would be blessed to have a Lew Jones. But, unfortunately for the rest of the world, Portland is the only city lucky to have one. And even this city takes him for granted most of the time. But look up the word prolific in the dictionary and guess whose picture appears in the caption? The Hemut Sessions finds Lew continuing his work with young Andrew Basil Walsh of Hemut, California. Walsh lends a fresh perspective to Jones’ diverse array of stylistic fronts. 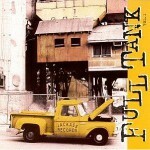 Here we find characteristic Jonesian acoustic ballads such as “Greater Innocence,” “These Ties That Bind” and “The Ballad Of Thomas McGragh;” and electric rockers like “Rockin’ On Down” and “The Days Of Providence,” interspersed with hip-hop beat/ Carribean flavors on “Train By The Seashore” and the downright weirdness of the performance poem “Western World Recovery Incorporated.” A full plate indeed. “The Days Of Providence,” which was reviewed as an advance track last Fall, stands as the most emotionally forthright and highly charged piece of work Lew has ever recorded. “Rockin’ On Down,” an earnest tribute and first hand recollection of Billy Rancher, captures the spirit of the music and the man; utilizing some of Billy’s trademark effects in a new way, without being imitative or condescending. In one light, “Corporate Chords” could be a slap at Kurt Cobain, in another it could be a poke at anyone who has sold their musical soul for the lure of the almighty dollar. “Mata Hari Bottle Blonde Blues” would seem not to have a precise antecedent in the annals of Rockdom, an experimental mood piece that incorporates the Ivesian concept of having several separate orchestras playing independent themes in different keys simultaneously. Not easy listening, to say the least, but rewarding all the same. Even more challenging is “Western World Recovery Incorporated.” Over a montage of a previously recorded song, “Europe,” are layered two tenors singing “The Star Spangled Banner,” an operatic soprano practicing a tuneless aria, a couple of violins at a Bach hoedown, random drum fills and grungy guitars, as Lew recites poetry which barely registers in the listeners’ consciousness. Fleeting images and vague forms collide with the musical onslaught, ricochet in glancing tangents, glinting like icicles in the sun. The modes are not as yet perfected, the technique still somewhat opaque, but I think these boys Lew And Andrew are on to something new and original with the sound they sometimes attain: unlike any three things ever heard before. Like listening to several cross-faded radio stations at the same time. In other guises, Lew merely improves upon the structures he has been exploring for all of History as we know it. Still more vibrant and exploratative than most. Another aspect that sets this CD apart from its rivals in the local marketplace are Walsh’s use of CD-ROM technology, applying cutting-edge MP3 sound files to allow for a bonus compilation of 78 additional tracks. This allows Andrew to showcase the various artists on his Moniker label, with three separate Lew Jones collections and two extended samplers, The MP3 technology allows for a whopping 650 minutes of “nearly CD quality” music. And through the standard Sound Blaster computer audio system, the sound quality is truly indistinguishable from that of a CD. MP3 players are available free via the Internet. Perhaps more than any other local artist, Lew Jones has been willing to take chances, to explore new and different aspects of his craft, sometimes seemingly on a whim. He has avoided confinement and dodged the pigeon hole, while remaining all the while tangible, cogent, pertinent and ultimately true to his own vision. So if he just wants to call himself The Act, who are we to stop him?